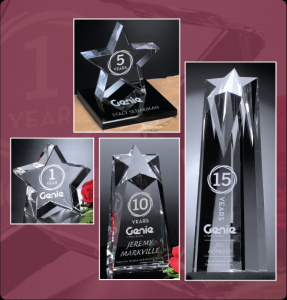 Selecting awards for your service award program is as easy as 1-2-3! Personalize it! Add names and logos. Typically, milestone increments are five, ten, fifteen, and twenty or more years. However, just like there are no two years alike, there are no two service awards alike. 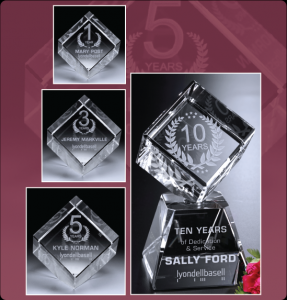 A great way to select your award is to decide on a similar shape or theme, making your one-of-a-kind award program consistent. Here are three ideas to inspire you! 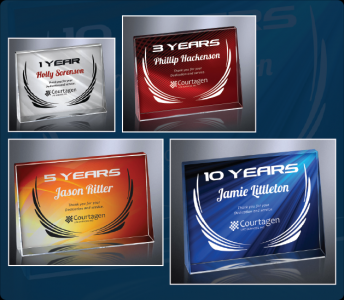 From start to finish, we can help you create a stunning years of service award. 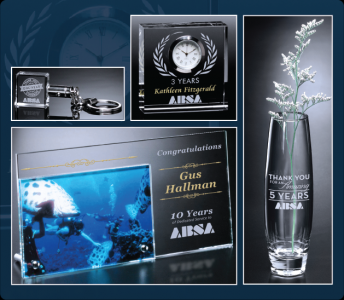 Let us help you create stunning masterpieces that will WOW your recipient. Here’s ONE more idea for a years of service program using cubes!